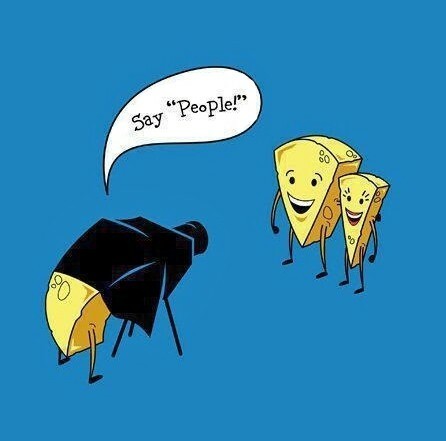 Have you ever wondered why the photographer says “SAY CHEESE” when taking a picture of a person or people? When someone says CHEESE – they typically open their mouth in a smile like manner. This also serves as a cue that “HEY I am ABOUT to take the shot, get your picture face on QUICK!”. According to Wikipedia, other cultures have taken to this American tradition of saying cheese when having a photo taken. In Japan, instead of saying “Say Cheese” they say “Cheese” (no say) – and the pronounce cheese as “chiizu”. Other languages have adopted this method, albeit with different words that sound similar to cheese to get the desired effect of shaping the mouth to form a smile. In Brazil the phrase is “Olha o passarinho” (“Look at the little bird”) or “Digam ‘X’” (“Say ‘X'”) (the name of the letter “X” in Portuguese sounds a lot like the word “cheese”). In Denmark, “Sig ‘appelsin’“, meaning “Say ‘orange'” is often used. In Finland, “Muikku” is the word often used by photographers to make people smile. In France and other French-speaking countries, the word “ouistiti,” meaning marmoset, is often used. In Germany, food-related words like “Spaghetti”, “Käsekuchen” (cheesecake) are used, mainly to make children laugh for the picture. In Hungary, the photographer says Itt repül a kis madár [here flies the little bird], but also the English “cheese” is used mostly by younger people. In Israel, the word used is ???? ????? (Tagid Gvina), meaning “say cheese”. In Japan, “Sei, No…” meaning “Ready, Set!” is often used. Also ??? (chïzu), meaning cheese, is used. In most Latin American countries, the phrase used is “Diga ‘whiskey’” (“Say ‘whiskey'”). In Russia, they say “?? ?“, prounced sir, which means “cheese” in Russian. The pronunciation is extended, to lengthen the time the “smile” is on the face. In Spain, say “mirar al pajarito” or just “patata“ (“potato”). In Sweden, “Säg ‘omelett'”, meaning “Say ‘omelette'” is often used. In Thailand, “Pepsi“, a popular soft-drink, is often used. Thanks PINTEREST ADDICTION for this find. The Pinterest Re-Pin is a series of something fabulous found on Pinterest. Follow me – leave your Pinterest link in the comments and I’ll follow you back. Need a Pinterest Invite? Let me know! Happy Pinning!